I grew up knowing that stories made a difference. As one of those children who loved the worlds my favourite authors created, I was rarely to be found without my head in a book, or just out of a book or about to drop into one. So my love affair with stories started young and has never left me. Stories you see, and I’m pretty sure you’ll agree, offer adventures, friendships, delightful time passing distractions, comfort and entertainment. My own children caught my love for books and I watched as they moved through phases in what they wanted to read – from stories that entertained and made them laugh out loud, to others that involved intricate adventures and make-belief, to those about young people just like them - and then sometimes not much like them - who were also discovering and finding their way in the world. “Reading gives us some place to go when we have to stay where we are” said Mason Cooley. How wonderful are the books that enable young readers, in their imaginations, to step into the worlds and lives of fictional characters and discover all sorts of amazing things about others, the world and themselves as they do so. But stories can do more than that. I truly believe in the power of story as a way to nurture, inspire and heal – especially for children needing encouragement and extra support at certain times in their lives. Small children snuggling up with mum or dad to share a story have an important bonding and emotionally strengthening experience. The right story here, whether it’s about starting school when they feel afraid of doing so, or getting used to the new baby in the family when this is proving traumatic, can give the opportunity for talk, understanding and reassurance. And for older ones, reading a story where characters overcome a particular problem or find a good way to deal with something, can give children the opportunity to discover new ways of seeing or thinking. I don't remember the title, but when I was eleven I read a special book about a girl who was the same age as me and had, just like me, an older learning disabled sister. I suddenly saw that there were lots of other families like ours - and sisters like mine! Stories with subtle, quiet messages can have a powerful effect and may help readers or listeners to feel less alone. This is what I call story therapy – the right book at the right time making a difference. 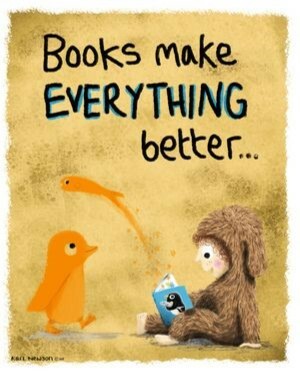 And perhaps even making everything better. That really resonated with me, and it explains the importance of reading so well. It expands our understanding of a bigger world to outside our own tiny sphere of experience. So important to young children in their own lives, and also as a habit for them to develop and see the importance of as they grow older. Interesting article, I love what you call 'Story Therapy', the right book at the right time, making a difference.